Dear Friends … It does NOT get any cuter than this. 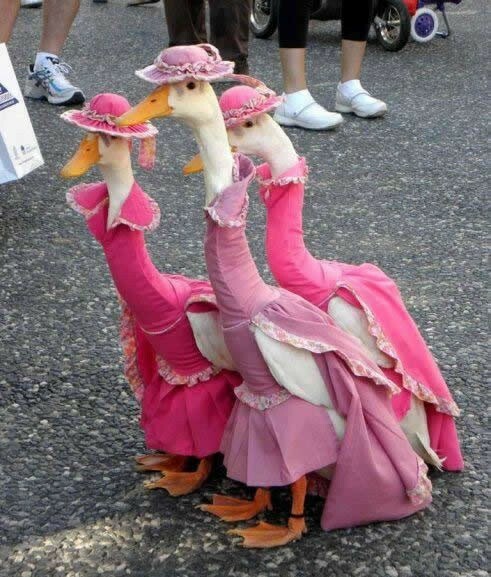 Cute ducks in pink dresses. Hand-tailored dresses and hats made just for these pretty duckies. Oh my dog, how could you not find this photo the best thing ever? I want a pet duck now! (Too bad they do poop quite a lot, and the house would get dirty quickly.) But to dress them up. Oh, it is just the picture of cuteness. Darling, why are these humans looking at us? We are just out for a sunny stroll. And what’s super cool is that these dresses fit the ducks perfectly. Oh, I am so jealous. They look like medieval maidens. What do you guys think? Oh so adorable. GracieLu those ducks are so cute. I’ve never seen it in real life before. Anyone who loves this must watch Disney’s classic movie The AristoCats. There are 2 adorable ducks in this movie that will remind you of not only the photo and clothes, but the caption! It has wonderful music and is great for kids and adults-this was cute! Thanks GracieLu! Wow, people think it is silly to dress up cats and dogs and just look at those ducks. They must be really nice ducks. Great picture. Take care.